"This was a humongous shock to both me and my sister"
Pop, lock and woah! 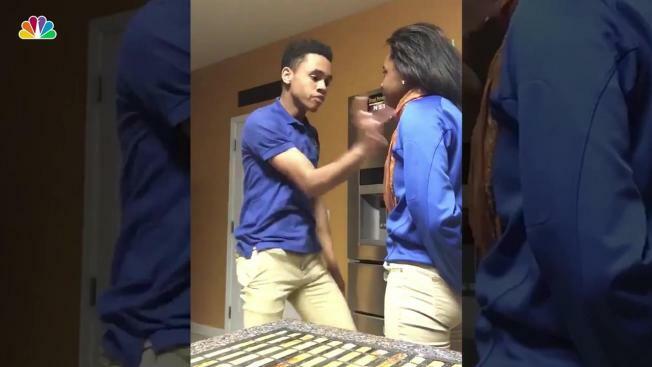 Two siblings from Villa Rica, Georgia, settled their differences through a silent dance off that is now going viral. The scene of the epic dance off between Francklef Dominique Lambert, 19, and his sister, 24-year-old Yve Alexandre, was a kitchen -- in front of the refrigerator. A video of the silent dance battle was posted to Twitter last Thursday with the caption "Don't say anything... just RT". By Monday it had over 3.45 million views. When asked if Francklef meant to go viral he responded, "Honestly no. This was a humongous shock to both me and my sister." As you get towards the end of the video, things get heated when Francklef throws off his jacket. The teen proceeds to mime pulling out his sister's beating heart and pushing it back into her chest. Viewers said it looked like his sister responded by eating his heart. In the end, the brother wins after serving up his last move which appeared to emulate cutting off his sister's face, making it a mask and putting it on his own face. "[We] dance like this all the time so it was like second nature for us," Francklef said. The Internet is awaiting the next dancing sensation, but don't be surprised if these siblings come back for round two.